Patchwork anything is fascinating. I marvel at the patience of crafters who join together hundreds of pieces of fabric to make large quilts, placemats, table runners and stuffed toys. I thought these people must have boundless amounts of patience to cut out little squares, only to sew them back together again. And I admit the patterns they create are so appealing. But then I discovered that quilters are clever crafters. They’ve developed all these short cuts to make quick work of the cutting and sewing they have to do. The technique I used to create this patchwork bunny uses jelly roll strips. Jelly rolls are pre cut strips of different fabrics. By joining the strips in different ways you get some amazing patterns. 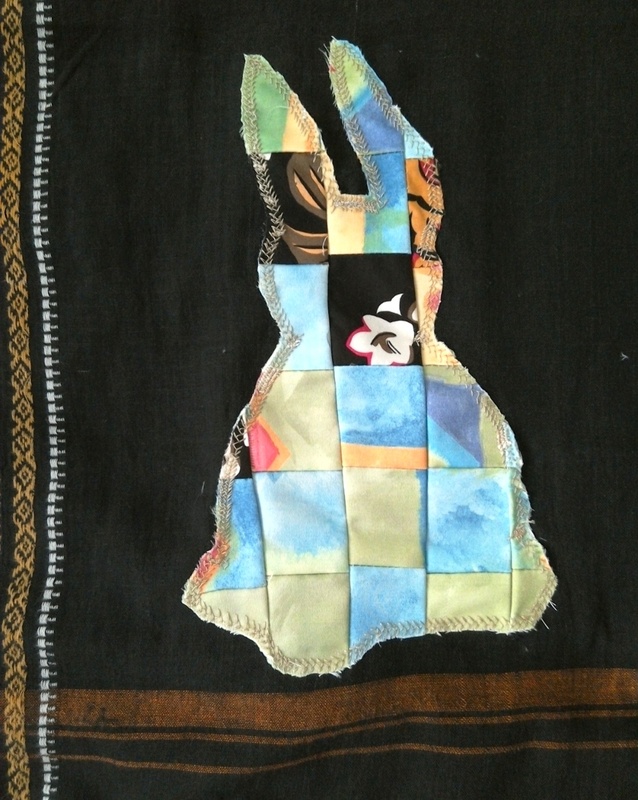 I then appliqed this patchwork piece in a rabbit outline (I have the Easter Bunny on my brain). A bit rough but it’s my first try. I need to learn how to get my corners straight. Any tips from quilters out there?